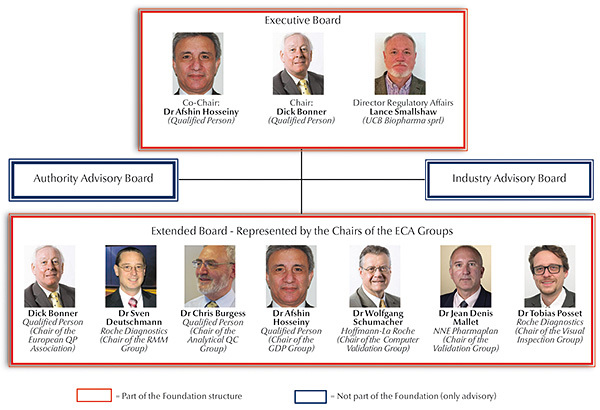 On 10 June 2015 the ECA Foundation Advisory Board set the course for the future with a new board structure. While the ECA Foundation Board so far comprised 10 professionals from industry and authorities, the Board is now headed by the new Executive Team with three members: the Chairman, the Vice-Chairman and the Director Regulatory Affairs. In addition to this team the ECA now has an Extended Board. In this Board the various ECA Interest and Working Groups are represented by their Chairmen. This new structure recognises and strengthens the Groups' increasing importance and allows them to be directly involved in defining and planning ECA activities. With every new ECA Group established its Chairman will also automatically become member of the Extended Board. In addition to Executive Board and Extended Board there are also two new Advisory Committees. To avoid any conflicts of interest for their members, though, neither of them is part of the ECA Foundation legal structure. The first Advisory Committee comprises members from EU GMP Inspectorates and from EU Authorities. The second Advisory Committee consists of members from other industry interest groups. This setup allows the ECA Foundation Board to involve colleagues from other industry groups and authority representatives for certain discussions on a case by case basis. It also allows them to remain independent with regard to any ECA publication, comment or position paper - e.g. when the ECA is commenting on new regulations or when the ECA is publishing Best Practice Papers. These groups' goal is to invite industry and authority professionals to get actively involved and to drive various activities in specific areas - like organising trainings, conducting surveys to provide feedback to guideline drafts, writing Good Practice Guides or white papers. In addition the ECA Foundation has established Europe's largest Academy for GMP professionals - with annually more than 70 GMP events organised in 10 EU countries. Also, only in 2014 the Academy organised and conducted more than 50 in-house training courses for companies and European Authorities. And the trend for 2015 and 2016 is showing a further increase. Today the advanced training provider counts more than 4.000 members, and the number is still increasing. To find out more about the new Board Members please see the ECA Foundation website.